Tubercular infection of the brain is very common particularly in developing countries and usually manifests as tubercular meningitis with associated hydrocephalus. Few cases of giant tuberculoma of brain have been reported in the literature. ,, However, simultaneous presentation of two giant tuberculomas involving two different compartments of brain has not been reported until now. We report a case of two giant tuberculomas in a child and its surgical management. A 30-month-old male child presented with headache with intermittent vomiting for 1 year, ataxia with difficulty in walking for 8 months. There was no history of fever, seizure. On examination, there was bilateral papilledema with right sided lateral rectus palsy. Head circumference was within normal limits with all the fontanelle being closed. Routine blood investigations, chest X-ray, ultrasound abdomen with pelvis were normal. Computed tomography scan showed two isodense round to oval lesions, one at the left fronto-parietal region and the other one at mid-line posterior fossa. There was gross edema around the supratentorial lesion with effacement of ipsilateral lateral ventricle. The infratentorial lesion was compressing the 4 th ventricle resulting in hydrocephalus. With contrast, both the lesions showed ring enhancement with slightly crenated margin of the supratentorial component. Magnetic resonance imaging showed the fronto-parietal lesion to be a confluence of multiple lesions, one giant one and a multiple small daughter lesions alongside the larger one. The posterior fossa lesion was with regular margins, oval in shape involving the left cerebellar hemisphere. Both the lesions showed ring enhancement with central hypointensity [Figure 1]. As the patient was a child, operation was done in two stages for removing two different giant lesions, one at a time to reduce excessive blood loss and duration of surgery. Decision was taken to operate the posterior fossa lesion first to relieve the pressure on the 4 th ventricle, thereby correcting hydrocephalus. Intra-operatively, both the lesions appeared as firm, minimally vascular, capsulated lesions containing yellowish-white, friable, cheesy material suggestive of tuberculoma. 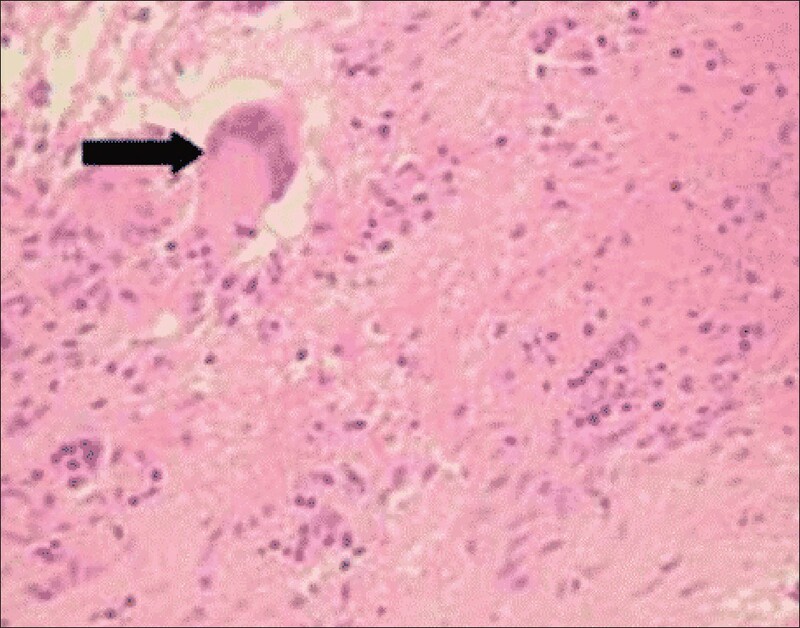 Histopathological study of both the lesions showed granulomatous reaction with caseous necrosis and Langhans giant cells [Figure 2] confirming both the lesions as tuberculoma. Post-operatively, patient developed transient cerebrospinal fluid (CSF) leak from posterior fossa wound, which improved with conservative therapy. The child had complete resolution of headache, vomiting immediately and that of ataxia after a period of 1 month. Patient is currently on anti-tubercular regimen for last 4 months. Minimal invasive procedures like burr hole and biopsy or stereotactic aspiration of the lesion to confirm the diagnosis was not preferred as the lesions were quite large and complete resolution of lesions with anti-tubercular chemotherapy did not seem to be feasible. Giant tuberculoma of the brain are rare and we could not find in the literature of any report of two giant lesions of tuberculoma occurring in two different compartments of brain simultaneously. Patients' screening for any systemic source of tuberculosis was negative. Most probably an occult source of systemic tuberculosis could have resulted in such bizarre hematogenous dissemination to brain. Such patients are likely to develop further tuberculomas of brain in future and must receive full course of anti-tubercular drugs, as appropriate for central nervous system tuberculosis infection. 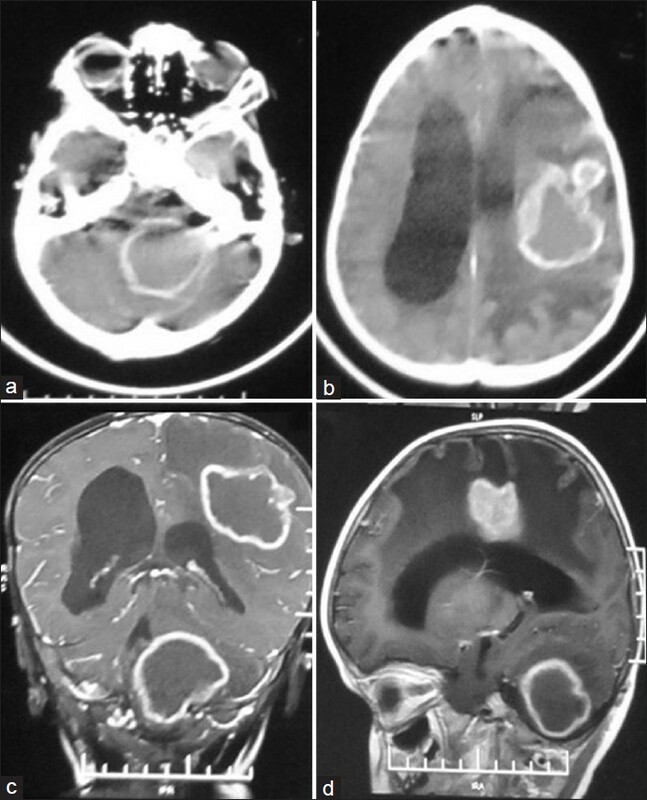 Differential diagnosis of the present case includes multiple brain abscesses, multiple intra-cranial metastases particularly from neuroblastoma, and multiple gliomas. Minimally, invasive procedures to confirm the diagnosis and role of anti-tubercular chemotherapy to completely eradicate the multiple, large lesions could not be relied upon. There is a requirement of long duration of these chemotherapy regimens, which can cause serious side-effects and there is a dangerous possibility of sudden deterioration of the patient during this regimen due to significant mass effect and hydrocephalus. So, operative excision remains the best treatment option for these giant, multiple tuberculomas. 1. Aniba K, Ghannane H, Jalal H, Belhaj Z, Ousehal A, Lmejjati M, et al. Giant cerebellar tuberculoma mimicking a malignant tumor. Neurochirurgie 2009;55:337-9. 2. Parihar V, Yadav YR, Sharma D. Giant extra-axial posterior fossa tuberculoma in a three-year-old child. Neurol India 2009;57:218-20. 3. Poonnoose SI, Singh S, Rajshekhar V. Giant cerebellar tuberculoma mimicking a malignant tumour. Neuroradiology 2004;46:136-9. Van Toorn, R., Solomons, R.
Guo, P., Lan, J., Ge, J., Mao, Q., Qiu, Y.